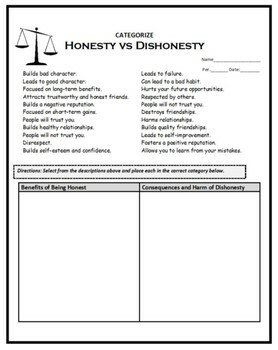 This lesson focuses on teaching students the importance of being honest and the cost of being dishonest. 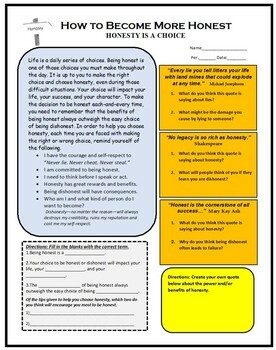 The lesson is easy to implement and can be given as an independent assignment or as guided instruction. This lesson also can serve as an excellent emergency lesson and can be easily executed by substitute teachers. · Identify common reasons why people are dishonest. · Explain the benefits of being honest. · Explain how being dishonest can harm you and others. · Describe key tips on how to become more honest.